Mammut Wall Key Lock Express Set. 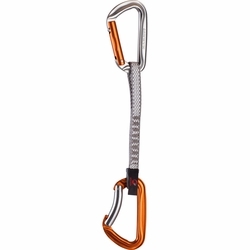 A light weight and perfect handling thanks to the key lock system – the Wall Key Lock quickdraw is the first choice for alpine climbing in rocks, ice and snow. The practical version, which can be extended to 60 cm, allows you to noticeably reduce rope tension when traversing or changing route.